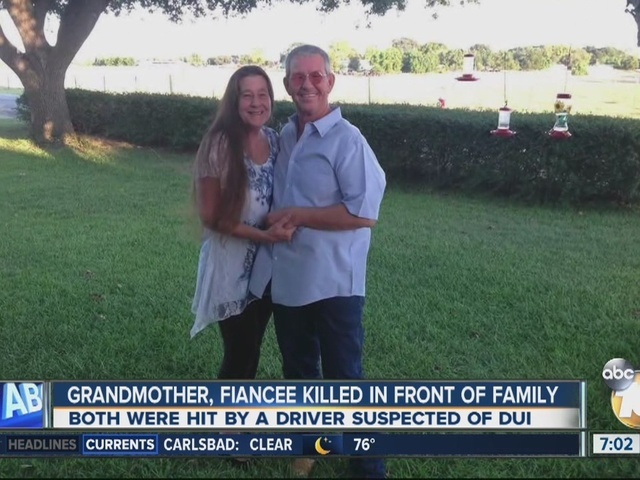 It was a 55-year-old woman from Texas who was killed -- and her husband was seriously injured -- as they were run over by an alleged drunken driver as they crossed the street in Lakeside. Lorraine S. Kennedy, 55, was hit near the La Palapa Mexican Restaurant in the 12200 block of Woodside Avenue, at 8:17 p.m. Friday, the San Diego County Medical Examiner said. Her specific home town was not released. Her husband was seriously injured, and his current medical condition was not obtainable. The driver was named as Katie Ellison, 21, who witnesses told police drove without her headlights on and traveled very fast. She suffered major injuries and was taken to UC San Diego Trauma Center, a San Diego news station said. Ellison was released Saturday night and booked into Las Colinas Detention Facility. Ellison was arrested for suspicion of felony drunken driving and murder, the station said. The couple had dinner with their two sons at the Mexican restaurant before the accident. A GoFundMe has been set up for the family of Lorraine Kennedy.